Insane In The Membrane. Removing the membrane from a rack of ribs. There are some deeply guarded secrets when it comes to making great slow cooked BBQ ribs. There are secret societies that protect the rub, sauce and mop recipes that create the best ribs as well as the cooking techniques that make them succulent and flavorful. What I am about to tell you is not one of these secrets. Sorry, we do not want to loose our membership to the secret society if in fact it even exists, it is a secret. But it is a good tip for making great ribs. When you buy ribs they have a meaty side and a bony side. On the bony side there is a membrane covering the entire rack of ribs unless your butcher is a saint and has already removed it. The quality of the ribs you prepare can be greatly enhanced if you remove this membrane. It is simple to do. Typically we will start on the biggest end of the rack but you start on whatever end you like the most. With a small paring knife or your finger start to loosen the membrane enough to grab. The membrane will be a little tricky to grab since it is slippery. Take a paper towel or kitchen towel and get a good grip on it. Slowly pull it back holding the membrane at a low angle as you pull it free from the rack. You may need to change your grip to accommodate getting the entire membrane off of the rack. That's it. 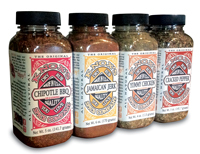 Now you are ready to season and bbq your ribs. Now your seasoning will penetrate the rib meat more evenly and allow your ribs to be tastier. This tastier rib is a direct reflection of how people perceive you. So stand in the bright light of glory and know you have provided a superior rib to your guests. Enjoy! Knox's All Natural Dry Rubs, At Your Service.